The Montecristo Petit Edmundo has been one of my favorite cigars for some time now, so I was excited to see what the longer Edmundo format had to offer. While a tad soft to the touch, the Edmundo has the same good looks as the Petit version, and later I found the construction to be outstanding with an even burn, ideal draw, and dependable ash. The smoke is a pleasant combination of cedar, leather, and toasty flavors. I’d agree that it isn’t as complex as the Petit format, but that doesn’t mean the Montecristo Edmundo isn’t a fine Cuban cigar. 1) With baseball’s worst record and third-lowest average attendance, the slumping Nationals seem intent on reviving the old saw of Washington as “first in war, first in peace, and last in the American League.” We can’t help but wonder what might have been had the team accepted our 2006 proposal to create a smoking section in the stands of their old home at RFK Stadium. 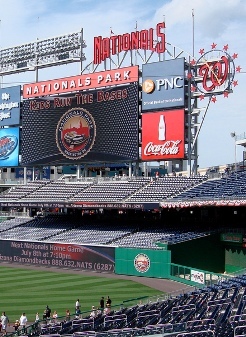 Is it too late to reverse a bad call for the new Nationals Park? 3) Inside the Industry: Camacho Cigars, best known for their full-flavored smokes, is releasing a Connecticut-wrapped cigar. Cigar Rights of America is further enticing membership, this time with an a sampler of 20 cigars made by industry leaders exclusively for CRA and available only to members. 4) Around the Blogs: Stogie Review lights up a Punch Rare Corojo. Fire Up That Cigar sparks a Don Pepin Garcia JJ. The Weekly Cigar smokes a Marco V Gold. Cigar Inspector inspects an ORTSAC 1962. Keepers of the Flame torches up an ITC 10th Anniversary. 5) Deal of the Week: With full-bodied spice and Cuban-like depth, people are turning to Nicaraguan smokes more and more, and this Nicaraguan Blends Sampler shows why. Included are two each from Padilla Habano, Man O’ War, Rocky Patel Fusion, and Gurkha Park Avenue, all for under $40. Grab yours here. Ever wondered what peat tastes like? Scotch is often described as having “peatiness,” but an exact description of the flavor is hard to come by. It seems some things are easier to taste than to describe, and that’s where the Tasliker 10 Year Single Malt Scotch helps out. The Talisker 10 Year is dominated by peatiness, which makes it a Scotch that not everyone will like, but some will love. The peaty flavor comes from the distinctive terrain that surrounds the Talisker, the only Scotch Whisky distillery on the Isle of Skye in West Scotland. Talisker, located in Carbost, has been making Scotch since 1830. The distillery, which is owned by the spirits conglomerate Diageo, makes Single Malt Scotch with ages varying from 10 to 30 years. 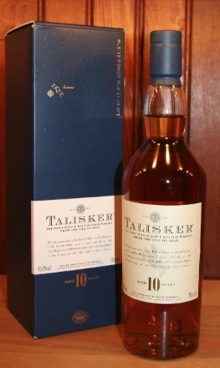 The Talksker 10 Year is the youngest Talisker single malt available and is available for $35-40 for a fifth. It has a golden amber hue and a vibrant nose filled with peat, pepper, and vanilla. On the palate you get more of the distinctive peatiness, with plenty of salty ocean flavor and an underlying sweetness. The finish is deep, peppery, and tapers off to a meaty charred flavor. It is a great scotch to pair with a cigar, but not any cigar can stand up to the intense flavors of the Talisker. I’d suggest going with a strong, full-bodied stick with plenty of pepper, earth, or cedar. I enjoyed the Talisker with the Padilla 1932 and the Cubao. I’d also recommend the Hoyo de Monterrey Epicure Especial, the Rocky Patel Vintage 1992, or the EO 601 Serie Oscuro. No matter what cigar you choose, you’ll find the Talisker 10 Year Single Malt to be a distinctive pairing. While that distinctive peatiness isn’t particularly approachable for the novice scotch drinker, those who love powerful,peaty single malts will find the Talisker 10 to be a little slice of heaven. With summer fast approaching, the temperature isn’t the only thing going up. Cigar smokers level of fear for the nasty cigar beetle increases right along with it. While most cigar makers have taken dramatic steps in recent years to control and eliminate the voracious pests, there’s no question that they remain a potential danger. For example, one of my Stogie Guy colleagues had beetle problems with some Cubans recently, and last year our friend Chris Verhoeven wrote about his sticks coming alive. There’s so much information, and so much misinformation, about beetles that it’s nearly impossible to sort it all out. Suffice it to say that their eggs, laid in tobacco, may begin to hatch when the environment is very warm and moist. Once free, the little pests just start burrowing, eating, and reproducing. 1) Make sure you have a good digital thermometer and hygrometer. Put in a fresh battery and check the readings frequently. 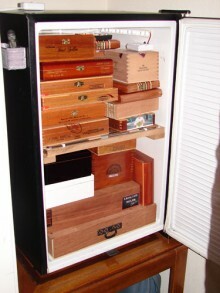 2) Depending on the nature of your home, simply moving the humidor to a cellar, basement, or cool spot can do the trick. Avoid putting the box too close to an air-conditioning duct to protect the wood and the cigars. 3) A simple remedy is a coolidor (if this isn‘t familiar, just Google it and you’ll find all you ever wanted to know). You can lower the temperature cheaply with freezer packs. Some experimentation will likely be necessary to figure out how many packs you need and how long they last. Also, even though they don’t melt, they may sweat, so keep them in a container or suspended tray to remove any possibility of cigars getting damp. 4) For a more permanent solution, you can try a thermoelectric wine cooler. It’s what I use year-round here in the Sunshine State. On the heels of its successful Perdomo Reserve line, which later evolved into the 10th Anniversary Reserve line, Perdomo released the highly-anticipated Perdomo ESV 1991 Vintage line in 2005. ESV stands for “Estate Selección Vintage,” and the line was an extension of the regular Perdomo Estate Selección line, which is no longer in regular production. This Perdomo ESV Vintage is comprised of vintage 1991 Nicaraguan fillers purchased by the late Nick Perdomo, Sr. in 1995. According to the Perdomo website, the tobacco was “stored in a bodega on the outskirts of Estelí” and “the existence of these rare tobaccos was discovered after Nick, Sr. passed away on July 2, 2004.” It’s far more believable than most of the stories of suddenly found caches of wonderful aged tobacco. Around the vintage Nicaraguan filler is a Nicaraguan binder and a U.S.-grown Connecticut shade wrapper. The thick 5 inch by 54 ring gauge Regente has a flawless, slightly pale, cinnamon-colored wrapper that is remarkably vein-free and velvety to the touch. I find the cigar naturally gives off subtle coffee flavors. After clipping, I notice a perfectly easy draw that will continue throughout the smoke, which lights up easily with just a few matches. I’d also encounter similary impressive construction with an attentively even burn and a solid ash. The Regente has a complex profile that combines dry wood, leather, and roasted coffee beans. Underneath there is a bit of cinnamon that provides subtle spicy sweetness. The dryness of the finish dominates the back end of the cigar’s flavors. Overall, the Perdomo ESV has great balance and complexity until the finish kicks in, which is so singly woody and dry that it distracts from the great flavors this cigar has to offer. Still, it’s a nice medium-bodied cigar with the excellent construction you’d expect from a stick that sells for $9-10 apiece. That combination earns the Perdomo ESV 1991 Vintage Regente a rating of three and a half stogies out of five.